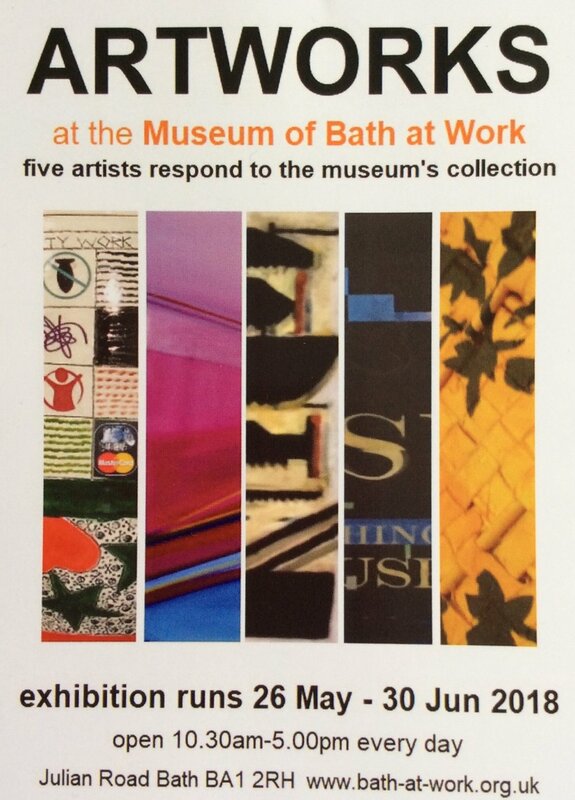 Bath Society of Artists open exhibition is on until May 12th at the Victoria Gallery Bath. I have two pieces in the show, one is a drawing done in Japan last November called 'Ready for Snow' which I am delighted to say has been sold and the other a small oil painting, 'Autumn Gingko'. Five weeks in Japan in October - November 2017 proved to be exciting and demanding. Exciting for the challenge and demanding because I was very much on my own and had to explore and find the right material to keep working. I had been keen to revisit Japan after a trip there two years ago. This time I went not as a tourist but to look, record, paint and get more of a feel for the culture. Hokkaido is not a historic area such as Kyoto, it was only settled in the 1880s, there are tributes to the Ainu people who already inhabited the island. I stayed at Tenjinyama Art Centre in Sapporo, the fifth largest city in Japan. Tenjinyama is a park themed to a cherry blossom area for spring viewing, autumn colour of maples, memorials to poets, two Shinto shrines with their tori arches, sacred trees, springs for purifying water and surrounded by woods. Being there in late autumn I watched the gardeners preparing for winter, they expect six feet of snow by December. Preparation involved tying bushes tightly so that the branches don't break and protecting trees by inserting a tall pole and tying ropes from the top to each branch to prevent them breaking with the weight of snow. The preparation for winter in the park inspired many drawings which have a very Japanese feel to them, the trees in the park and in private gardens are twisted, contorted and pruned to make unusual shapes, like bonsai but full size. I have continued to draw in the same way since my return with some success. My other theme, on which I had been working for all of last year, was 'City Lights'. Perhaps the most remarkable impression of Japanese cities is the advertising, lights all over the buildings, many flashing and constantly changing, a riot of colour and confusion, at least to my eyes, being unable to read Japanese, it all looks wonderfully visual without the distraction of having to know the message. I painted fifteen variations of one moving sign, there could have been dozens more and since my return I have completed four large scale pieces. 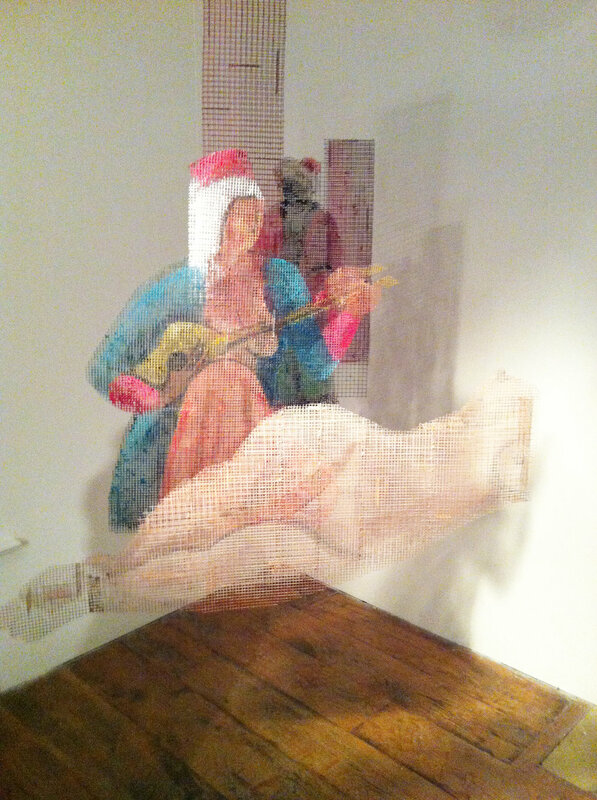 Charlotte’s latest work is painted on wire mesh, and hung up in the gallery space – off the wall! The paintings hover in the space and you can walk round them, yet they are not sculptures. 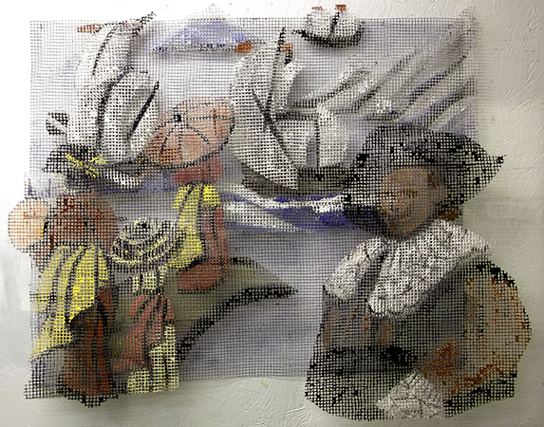 They are re-workings of old master paintings and clues will be available as to what the originals actually are. But they are new beautiful works in their own right and you will enjoy spending some time in their strange unworldly presence. 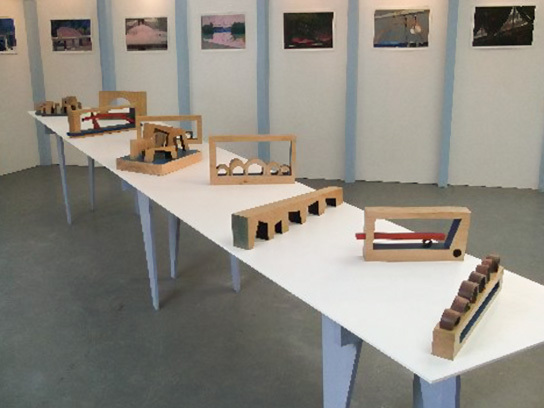 As in their previous exhibition Empty Chairs, Charlotte and Martin have again collaborated on a particular theme: this time the subject is bridges. The word ‘bridge’ has been used metaphorically in a variety of ways, from bridging the earthly with the divine, to more colloquial uses such as ‘bridge over troubled water’. The works in this exhibition explore the forms and symbolism of bridges in wood, clay and print. A solo exhibition featuring Charlotte’s unique mesh pictures and carborundum prints, complimented by paintings relating to the mesh pictures in style and subject. A collaborative exhibition of prints by Charlotte Moore and sculptures by furniture maker Martin Kalberer was held at the Bath Artists’ Studio Gallery 19th - 22nd May 2011. The commonplace chair is easily taken for granted in everyday life. But to see the chair simply as a piece of furniture is to overlook its metaphorical and allegorical power.